Location: Humbie, East Lothian, Scotland. Ownership / Access: Rogers family. 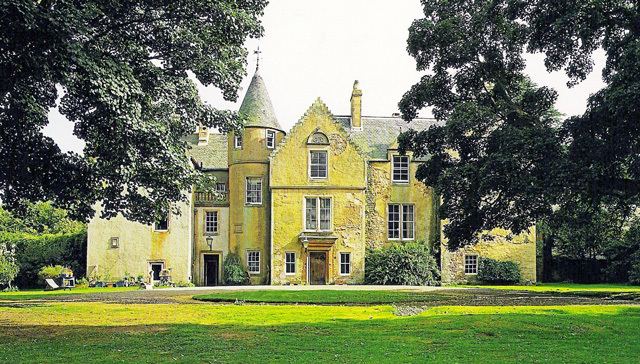 Notes: Keith Marischal is a Scottish Baronial Country house lying in the parish of Humbie, East Lothian, Scotland. The original building was an "L-shaped" Tower house, built long before 1589 when it was extended into a "U-shaped" courtyard house. The building acquired its modern appearance in the 19th century, when the courtyard was filled in. The house is protected as a category B listed building.Its sale in the late 17th century to the Earls of Hopetoun, was to see much structural alteration to the building. The Hopes were originally an Edinburgh family with strong links to the law. During the Williamite Revolution the Keiths were attainted as Jacobites. The Earl Marischal was coerced into the redistribution of his properties, Keith Marischal included. The property was sold to either Sir Thomas Hope, 1st Baronet or his son Sir James Hope of Hopetoun. The Hope family were engaged in wholesale acquisition of the property of Jacobite sympathisers and eventually managed to amass massive estates in the Lothians over the course of the 18th century. it is they who carried out the quasi-symmetrical extension to the west of the house to construct a new wing, forming a courtyard house. The east wing being the original tower. Before 1889, it was sold to the family of Patrick Fraser Tytler who hired the Edinburgh firm of Peddie and Kinnear to construct an extension that would fill in the courtyard and provide corridors in the building rather than the more archaic passage from room to room. It is at this time that the exterior was baronialised with faux turrets and crawstep gabling to complement those extant. In 1953, the property was acquired by the architect Sir Robert Hogg Matthew; it is currently owned by the Rogers family.